At breakfast in Alness, I met a group of repertory actors, who took their variety show around Scotland for the benefit of schoolchildren. In remote areas, this is the first time that some children see live theatre. The actors carry their set with them in a truck. The Alness B&B did not have ensuite facilities, but it had two bathrooms with jacuzzi-size tubs. I took advantage of one to have a good soak and also to wash some clothes. Little did I know that they would switch the central heating off at 8 pm, leaving my clothes wet on the radiator overnight. This is always a danger but generally there's a hair dryer to save the day. 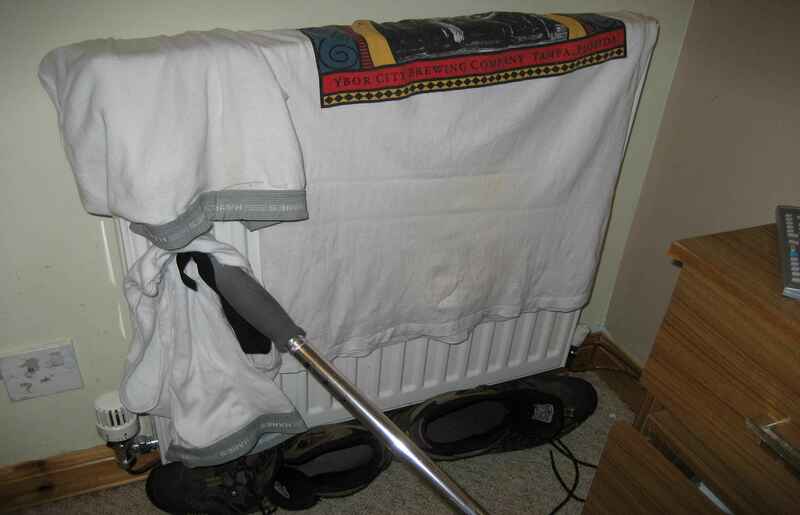 This time, I had to carry the wet clothes in a plastic bag separate from the rest of my backpack's contents, later drying them fully on the radiator in the Tain B&B. I compared my life with the acting group's: they took their show on the road with their friends in a nice warm truck at 50 mph - and were greeted with applause wherever they went. I took my wet laundry on the road cold and alone at 2 mph wearing wet boots - and no one noticed. They did so with government money, and I with my own. Their occupation: "actor". My occupation: "vagrant". Some people have worked out life better than have others. I jest. I took back-roads to Tain, saving me from the busy A9 and theoretically also saving a mile or two as well. My route started with a shortcut through Alness's quarry, which I traversed with permission, feeling rather virtuous that I'd actually gone to the office and obtained it. From then on, it was quiet byways, where I encountered the second and last end-to-end walker of my hike, a lady whose husband provided support in the form of a camper van which carried her equipment and housed them both at the end of the day. She was headed south and was just coming up to her first hundred miles, doing about the same daily distance as I do. I wish we'd exchanged contact information for later. You can easily imagine how much end-to-enders have in common. I drew a contrast between us, and a fellow I met last night - who was possibly a nutter (U.K. parlance) or nut (U.S.). He was dressed in army camouflage, and strode out of Alness with a plastic bag of food. We got to talking, and he enthused about life on the road through missing yellow teeth (I infer their color from those which remained). I wondered where his pack was. It turned out he had a bike in the woods somewhere, was following a random route to nowhere in particular, and was wild-camping. We parted in mutual admiration before he asked to share my 8-ft by 5-ft B&B room. He was probably relieved that I did not ask to share his tent. Shortly after meeting the end-to-end lady, I came to a "road closed" sign because of a bridge in imminent danger of collapse. It had been a very weak bridge before, its 3.5 ton capacity being barely enough to support an SUV with a trailer. Now it was apparently too weak even for pedestrians. 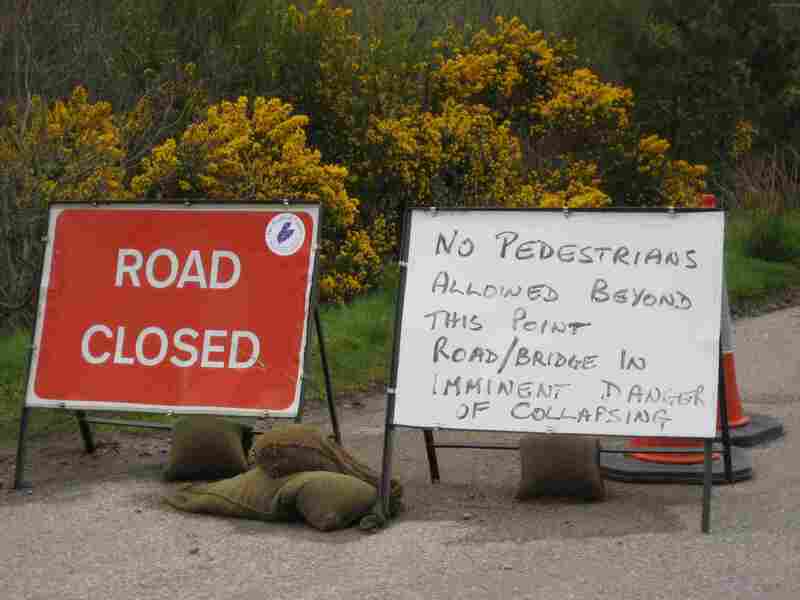 The closure notice was hurriedly written, and the detour signage was not too clear. Nevertheless I found a way through some rough gravel roads up Glen Aldie. The additional mileage probably erased any savings from my shortcut avoiding the A9, but it was a much more pleasant route anyway. In the midst of this detour, I met a lady radiographer, Alison, walking her dog, Teal. She was able to give me directions to my B&B in Tain, even knowing the names of the owners. Tain has some 4,500 residents, so it's not much more than a large village. It’s a delightful historic town. 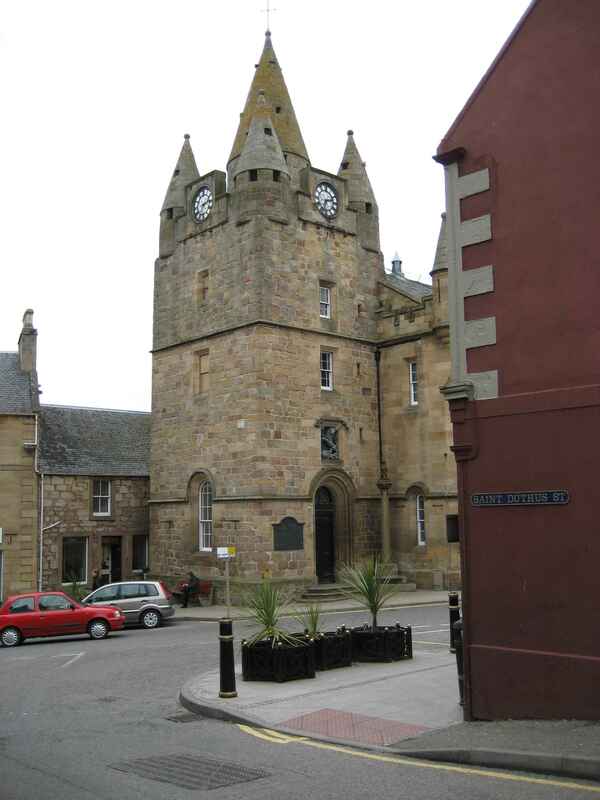 Some buildings, such as the clock building or "tolbooth", are quite noteworthy. It's the oldest Scottish Royal Borough, being granted this status in 1066, but its existence probably predates the times of the Norse invaders. Tain is on the coast and has a relaxed atmosphere; I am sure it's worth a return visit. Applying my new and probably-overdue accommodation policy, the first thing I did after checking in at my Tain B&B was to book tomorrow's B&B in Golspie up the coast. What made this easier is that Golspie is the only logical place to stay and I had a list of B&Bs there. Then it was off to Tain village to find a payphone to talk to United Airlines about my flight home. After all, I am running (actually, walking) three weeks ahead of my original schedule. A payphone seemed a better bet than my cellphone for an extended call through United's telephonic roadblocks. After three abortive calls on a crackling line with the meter gobbling my money, I left them checking the fare rules somewhere in the Far East. I could have told them the fare rules in five seconds, but that is not the protocol. The last time I changed my flight on United from Britain they confirmed all on the phone, but the agent forgot to press the right button on her computer at the end, so no change was actually entered into their system - becoming the problem you can imagine later at check-in. On another occasion, when I checked in for my Heathrow flight, they were doing an update on their worldwide reservations system, sensitively choosing a logical-enough 3 am in Chicago. This hour of the night was, however, quite awful for their European passengers, who now faced a three hour line-up to check in at what was 9 am local time. But I digress. This time I was lucky enough to have my own personal reservations agent; Jenny ended up calling United from Florida using the 800 number they provide in the U.S., and 40 minutes later she was able to switch my return flight date. Yes, hiking is about walking, and shelter and food - but real life seeps in at the edges.